Please note: all prices are in UK sterling (GBP£) and correct at the time of filming (April 2017). my name is Richard I run a company called The T Service based in Oxfordshire. 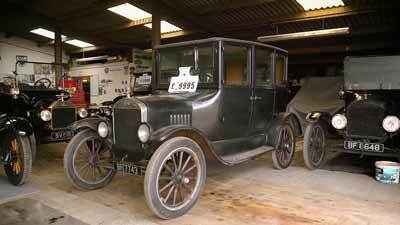 We’ve been specialists in the Ford Model T for just over five years. 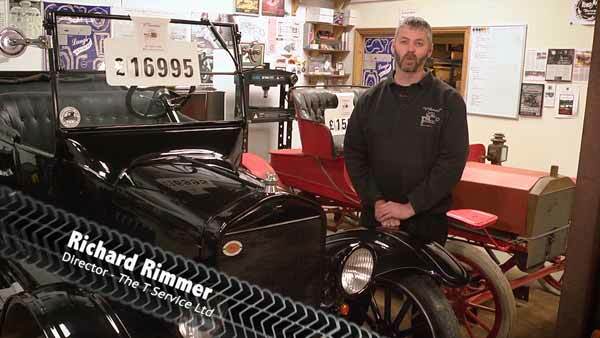 We do pretty much everything involved with Model T’s from selling complete cars, selling parts for the cars, servicing and repair, spending time teaching new drivers how to drive them, how to care for them, so we can cater for pretty much any requirements. 1. What’s great about owning a Ford Model T? They’re one of the most accessible vintage cars. The parts are reproduced in large numbers, particularly in America. They don’t require any special tools,really in general you can maintain them with a typical home toolkit. Leaded fuel wasn’t available when these were new so they will run without any modifications, they use a bit of oil, it’s a very straightforward oil, available easily and they’re just a real feel-good car, you get out on the road, you’ll have people smiling and waving at you, camera phones will be whipped out, they make everyone smile. Essentially with Model T’s there’s three different Eras. The earlier cars are classed as the brass era cars and that’s defined more by the radiator style and color than anything else. 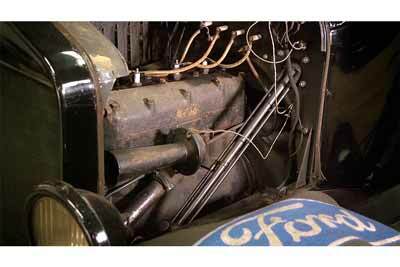 As the cars developed Ford we’re looking to reduce the cost of them, they introduced the steel radiator shell. Steel obviously being cheaper than brass this was then just painted black just to to protect the metalwork really. There were two different eras of black if you’re being picky separated by about an inch and a half height difference on the radiator. After this they went to a nickel shell. There’s not a great difference underneath the skin, they’re all essentially the same car, using essentially the same engine, transmission and rear axle. They were developed considerably but to all intents and purposes underneath they’re the same car. Ford Model T’s were made of very high quality steel. Some of the British built cars where they’ve been in the UK environment all of their lives may suffer more from corrosion but generally the cars that come over from the States, they’re in drier environments, they last incredibly well. The open cars in particular use a wooden frame that all the metal panels are then nailed onto if that’s been kept in a particularly dry environment the wooden joints can become loose. It’s very hard to ascertain the condition of that because it’s all hidden away under panels but in general if you open the door and everything feels a bit floppy that’s time to start thinking that there may be some work needed underneath. You can get replacement parts, they are remanufactured in the States, the gauge if the steel isn’t quite the same but to the untrained eye you wouldn’t notice the difference. 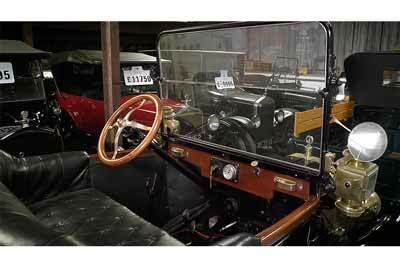 Something to consider when you’re looking to buy a Model T is the condition of the interior. If it’s an unrestored car and you like that particular look you can always just throw a blanket over it if you’re looking to restore a car you need to consider the costs. The open cars you’re looking around £750 pounds for an interior kit that will cover the kick panels, the door panels, the seat coverings, they come with the padding already sewn in. The enclosed cars however used a wool cloth type interior, that’s far more expensive, you could be looking at around 1500 pounds for an interior re-trim and that’s plus fitting. So consider what type of interior you are looking for, what sort of condition you expect it to be in. Can you put the top up? Ask the owner to give you a hand to put the top up. Check the condition of that. Again replacement kits are available but you need to consider that within the price that you’re looking to pay. At the front Springs you’ve got two outer shackles and then a third point that mounts to the back of the transmission. What you want to check for is the condition of the shackles. These are wear and tear items. It depends how well the car has been looked after as to what sort of mileage you’ll get. They are plain bushings, so they rely on regular oiling to keep them in good condition. Likewise the leaf spring itself, they should be kept oiled regularly. I would always prefer to see an oily car than a dry one, it suggests that the owner is taking care with it. Whilst you’re looking at that front suspension, check for play on such things as track rod ends and kingpins. Rear end of the car very similar to the front. You’ve got the leaf spring which is attached to spring shackles. Again check for wear in the plain bushes. Again a nice oily car suggests that the car has been maintained. Check the wood spokes on the wheels. Modern garages are much drier than the conditions these cars would have originally been kept in. The wood can actually shrink, you end up with loose spokes when you’re driving along, it’s quite frankly dangerous. Tyres, easily available but you’re looking at around £150 to £200 a corner. Fire up the engine have a listen to that. They’re not quietest engine, they’re essentially the same as a tractor engine. The water jacket only covers the top end of the motor, so you do get a fair bit of noise but listen for anything that sounds particularly deep that could indicate that you’re in for an expensive rebuild. Given that the cars start at £10,000 a rebuild by specialists could cost you £5,000, so it’s very important to listen for that. The place to look for cracking on the Block on the water jacket, take a look particularly down the left-hand side of the engine that’s where it tends to show the cracks. The gasket surfaces aren’t up to modern standards, don’t be surprised if you see a few drips of oil underneath the car, particularly after a run once the engine oils up to temperature. If there’s particularly large pools of oil you need to investigate a bit further. The engines themselves will keep running until they’re in really poor condition, on a Model T (owners club) rally and you’ll hear some cars that you think they just shouldn’t be running it’s not how we recommend you drive them, but they will keep going until the last legs. 7. Gearbox and transmission checks. Transmissions are particularly difficult to check on a Model T.
There is a small inspection cover on top of the transmission that allows you to access the transmission drive bands. Now they are a wear and tear item. A typical new owner to a Model T will be a bit harder on them than someone who’s more experienced. Relatively inexpensive to replace, around £50 each on an exchange basis, a couple of hours work for a specialist to fit. The early cars unfortunately didn’t use a removal type of band, so that involves removing the whole transmission cover to get at them. So ask the owner, when did they last change them? Is there much adjustment left on them? That will give you a good idea as to whether you’re going to have future maintenance issues. The exhaust on the Model T is a very simple setup. You’ve got a cast-iron manifold that bolts directly to the engine. Over time these can warp slightly, they tend to droop at the back end. There’s a cheap gasket setup that you can buy that allows you to still use these manifolds but, realistically, the the best option is to look at replacing it if it’s got to that stage. The cast manifold itself costs about £100, not a huge amount, from there you’ve got a down pipe, very inexpensive, very simple you’re looking at about £15 for one of those. At the back end you’ve got a very simple muffler, there’s no sound deadening material as such within these, they’re simply three tubes that recirculate the air within them reducing the noise. The later cars use a much simpler pressed steel end which is fairly inexpensive, the earlier cars used a cast end muffler a little bit more pricey. The electrics on a Model T are essentially very simple. They don’t have a great deal running on them. The early cars run a gas carbide system for the lights, so they no electrics there. Later cars use very simple single wire electrics. With those the car will run all day long on a battery – no problem. 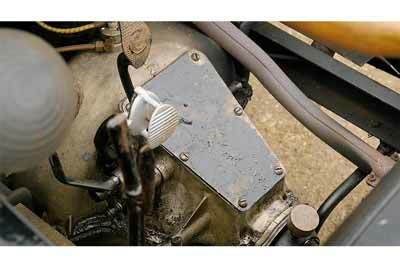 The early cars didn’t run a dynamo system so you’d be looking at recharging the battery every two or three days. The magneto set up allows the car to run without using a battery at all. So you tend to use a battery just for starting and then switch over to Magneto. It’s not uncommon for Magneto’s to fail on Model T’s. It’s not too detrimental to the the use of the car, you can still run it all day long on battery with no problems whatsoever. Unfortunately to rebuild the magneto is an engine out job. If you particularly want a car that’s 100% original and running as it would have done and the magneto has failed it’s an expensive job, so consider that in your purchase price. 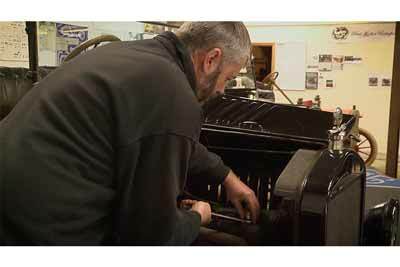 Model T’s use an unusual ignition system compared to modern cars. Where the typical modern classic will have a single coil, the Model T uses four trembler coils. 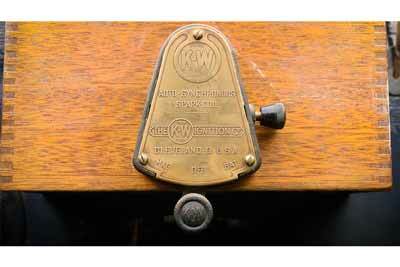 Originally these were a wooden coil box on early cars mounted behind the firewall. On the very late cars they sit on top of the engine. They make an unusual sound but it’s part of the character of a Model T to hear the trembler coils operating. Over the years they’ve developed a very poor reputation because people haven’t looked after them. They can be troublesome but once refurbished they can be very reliable. If you can drive the car or if you can get an owner to take you out in the car, you want to see how well it conducts itself on the road. It’s not uncommon for parts to wear but you should be able to drive a Model T one-handed with it not wandering around the road or shaking the steering wheel. The low speed drive is particularly noisy. It’s a common trait with Model T’s don’t be alarmed by it. Unless it’s particularly bad, accept that as a normal Model T trait. In direct drive in top gear the car should be pretty quiet. You shouldn’t get any abnormal noises from the back end. Sadly a lot of the cars that come in from the states don’t really come with any history at all. It’s just American culture that they don’t keep much in the way of records of the cars. Which is a real shame they’ve all got such a story that they could tell us we know nothing about them. Other paperwork – registration document, take a look at this make sure the car is correctly registered. Many are registered with the incorrect engine capacity. The standard engine capacity for a Model T is 2892 CC but you will see them registered as 3 litre, 3.3 litre people just get confused as to what they are. Chassis numbers weren’t a common thing on the Model T’s until the 1926-27 cars at which point they were stamped on the chassis rail underneath the right hand side of the front floor. Engine numbers, easy to find they are on the left hand side of the engine. Adjacent to that on the casting you’ll often have a date casting for the the engine block, which gives you an idea whether that’s a correct unit for that car. Engines from early and late cars are interchangeable, so you will often find that engines have been swapped. Don’t get too hung up on that, the condition of the engine is the key thing. The Model T was such a popular car in its day, there was a huge aftermarket business for accessories and so-called improvements to the car. You can buy all sorts of weird and wonderful things for your Model T, from a cooker that attaches to the manifold. Practical options such as step plates that bolt to the running board to save you scratching your paint. Many of these are actually reproduced these days but there’s a certain cachet to having an original optional accessory. 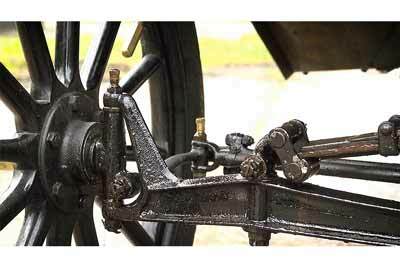 Two of the most popular things that you could look for when you’re looking to buy a Model T are a Ruckstell axle. These are (Ruckstell axles) a two-speed rear axle so they run an epicyclic gear setup which allows you to change into a different ratio for hill climbing. Particularly on the heavier cars, the enclosed cars or the four seaters – where you’ve got four people in the car, 20 horsepower will get you there but it’s going to take its time. Having a Ruckstell will allow you to change down the ratio and makes life a lot easier on the car. The way to tell if a car’s got a Ruckstell fitted is you will have an extra lever within the cockpit of the car. It’s a two-position system. It will either be mounted in the centre of the car or there’s a modification that allows you to run the lever in the same slot as the handbrake lever. They’re quite an expensive thing to retrofit to a car you’re looking in the region of two and a half to three thousand pounds. So if you can find a car that’s already had one fitted – great! They’re (Ruckstell axles) not hugely common but lovely to have if you can find one. Rocky Mountain brakes are another popular upgrade to the Model T. They essentially add a connection to the rear wheels and the foot brake. They have certain safety benefits. For example, if you were to break a prop shaft or a universal joint you would lose your transmission brake and you could only rely on the handbrake as a stopping method. The Rocky Mountain brakes connected directly to the foot brake will stop the wheels. 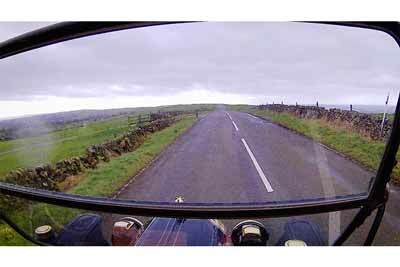 Limitations of them – in the wet they don’t work particularly well, but you’ve still got the transmission brake there as a backup, and they don’t work too well in reverse. If you want the ultimate improvement you can even get a disc brake conversion these days but they don’t look particularly period. With the brass era cars, if you can find one that’s had an electric start conversion, that’s great. It’s an expensive conversion that can be done to a non electric start car but you’re looking in the region of two and a half thousand pounds. The other thing you can look for in a car is the demountable wheels. Very desirable, allows you to carry a spare rim on the car with an inflated tire. It’s a five minute swap as opposed to having to take a tire off and replace an inner tube. Consider where the cars being used. Is the Model T being used on rallies regularly? It suggests that it’s a good working car. 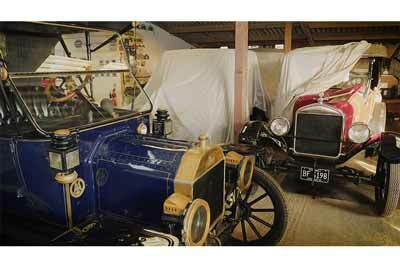 Has the car you’re looking at come from a museum? Ask why it went into the museum in the first place. These cars are designed as static exhibits, in many cases they’re designed to look good from a distance, once you get closer up chances are there’s filler that’s been used, the cars gone in with a broken axle for example. You might be buying something that’s got trouble. Has the car being built as a show car? Some of these cars are designed to drive on and off of a trailer, drive around a show ring and be judged. In that situation they don’t want to see oil everywhere. But has the car been built with the correct amount of grease and oil in all the joints or are they going to start wearing very quickly as you start to use the car? The other thing you should consider is whether you’ve got the space for the enclosed cars. Some of the enclosed cars are much taller and won’t fit in a standard up and over garage. The convertible cars, you can pop the top down and they’ll go in a conventional garage. The footprint they take up is similar to a modern fiesta so they will fit in a standard garage. Period correctness is something that does concern some people when they’re purchasing a Model T. What you’ve got to be mindful of is that the Model T was in production for quite a number of years and a lot of the parts are interchangeable. Going back 30, 40, 50 years people didn’t have the aftermarket supply of parts that we have today. So they would find a Model T in a hedge and if there was a working part on that vehicle that would repair their own car, they would take it and put it on. You’ve got to decide whether you particularly want something that’s a hundred percent accurate that you may end up searching for parts the rest of the cars life and never have it on the road or you accept a few things that are incorrect, get out there enjoy it. The later black-radiator cars and the nickel radiator cars are less susceptible to this. Generally people that own these cars are more accepting of things not being a hundred percent correct. The brass-era cars, less so. People that are buying these like to have things as they should be, particularly if they’re getting involved in veteran car club events. Realistically it makes no difference at all. The important thing is to get out there and enjoy them, use them, make the most of them. You should take some care with buying a Ford Model T, obviously it’s a hundred year old car. Metal fatigue isn’t really an issue with them but making sure everything’s safe or as safe as a vintage car can be is paramount. The ideal situation is to take someone who knows Model Ts with you. They’re going to be familiar with the noises they make, they’re going to be familiar with the driving technique and they’re going to be familiar with the points that wear on them. In an ideal world take a specialist, they’re working on these cars day-in day-out and they’re going to know where to look for trouble. This video and the information within it is intended for guidance purposes only. Neither carphile.co.uk or The T Service Ltd shall be under any liability in respect of any information/views contained within this video. Please be advised to always consult a qualified specialist before making a decision to buy a car. Any prices stated should be read as a guide price only (interview April 2017).